This product is a keeper! Munch on nutritious quinoa anytime, anywhere! Instant Quinoa cooks up in minutes on the stove, or just add a little water, and watch it come back to life while on the go! Already cooked, just add some water and BAM! You have fluffy, versatile Quinoa that's ready in an instant. How will you munch on Quinoa? Busy morning? 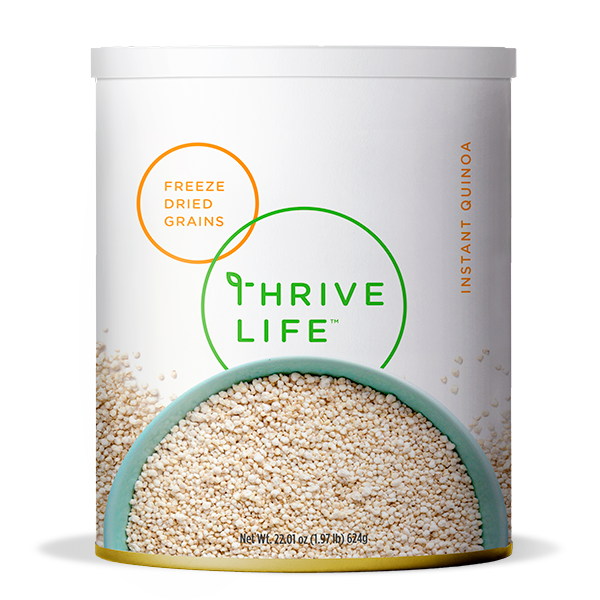 Add some milk and your favorite Thrive Life fruits for an instant breakfast you can eat while heading out the door. Don't have time for lunch? Add some seasoning and your favorite Thrive Life veggies for an easy lunch you can munch on at your desk. Bring 1 cup of Quinoa and 2 cups of water to a simmer for 2-3 minutes. Rinse and drain any excess water. Use Instant Quinoa as the base for a salad or for breadsticks. On the go? Add some hot or cold liquid to your Quinoa, let it rest, then enjoy like oatmeal or cold cereal!